Harrington String Quartet will give three concerts in 2017-18. Harrington String Quartet will stock its upcoming season with new-to-them works by an array of familiar and lesser-known composers. "We wanted to do works that had not been done by (the quartet) in a long time — if ever," cellist Emmanuel Lopez said. "That moment when we decided what to do next year (was) great. We're looking at things we never thought we would look at together. (The season) consolidated very quickly. It's very reassuring to me." The season — dubbed Kaleidoscope: Timeless Masterpieces — will feature three concerts all held at Amarillo Botanical Gardens, 1400 Streit Drive. Season tickets are $50. Call 806-651-2840. 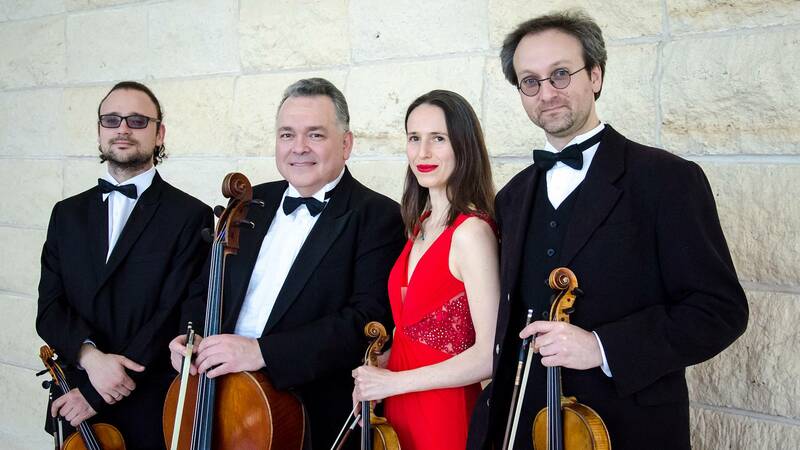 The season will open Nov. 10 with a concert featuring Wolfgang Amadeus Mozart's String Quartet K. 589. Fritz Kreisler's String Quartet in A Minor and Ludwig van Beethoven's String Quartet Opus 59, No. 1. Kreisler's name is certainly the least recognizable of that trio, and while he was renowned as a performer and composer, his string quartet is lesser known. "He was a very famous violinist, one of the greatest violinists of the first half of the 20th century," Lopez said. "He also was the composer of many violin pieces which violinists still play today ... but (he's) not really associated with string quartets, and this is the only one he wrote. "We felt this work, since it has never been played here to my knowledge by the Harrington quartet, was a wonderful way to introduce the first program," Lopez said. The Feb. 18 concert will feature Alexander Glazunov's Novelettes for String Quartet, Dmitry Shostakovich's String Quartet No. 4 and Franz Scubert's String Quartet in G Major. The Shostakovich is another work never performed before by HSQ, Lopez said. "That's part of Evgeny's influence on us," he said, referring to the quartet's newest member, violinist Evgeny Zvonnikov, a native of Saint Petersburg, Russia. The season will close April 13 with a concert featuring Pyotr Ilych Tchaikovsky's Quartet Movement, Hyacinthe Jadin's Quartet Opus 2 No. 1 and Johannes Brahms' String Quartet No. 1 in C Minor. If Jadin's name isn't familiar, Lopez isn't surprised. "That's something none of us had ever heard of," Lopez said. "Vesselin (Todorov, the quartet's violist) found it in his research. He didn't live very long (24 years), but he wrote several string quartets, and we were particularly struck by this one." Lopez is the senior member of the quartet by a good stretch: He'll begin his 27th season this fall. Violinist Rossitza Jekova-Goza joined in 2010, and Todorov joined the following year. Zvonnikov joined in February. "As far as I'm concerned, this is the best quartet we've ever had in many ways," Lopez said. "The other personifications were also unique in their own way and wonderful, but I feel that with my experience here and my colleauges bringing all of their unique styles of playing ... I think this is the best blend we've ever had." "I feel so privileged to be able to do all of this repertoire with them." The quartet was formed in 1981. Its members are music faculty members at West Texas A&M University.